Start with a base sealer and apply to entire cup. Place a pre-printed template of your design choice within the cup. Apply glass or acrylic paints as you wish. My design turned out very different from the template above, but gave me a guide to work from. The final coat sealer (center) will be applied when you are finished painting the cup. I painted the grapes with a lavender paint first then embellished them with purple and outlined and highlighted the with black curly cues. The same process was applied to the green leaves. I also applied a copper brown and copper metallic paint on the leaves. Apply grape vines with a black or brown Sharpie pin. Choose your desired shade of green scrapbook paper and stamp cut leaves from the paper. Have raffia ribbon and wire ready to finish the wrapping of your cups. Insert white tissue paper into cup so that the design will be easily seen, Insert cup, that has had final sealer coat applied and dried (for ten days) into a cellophane bag. I added Hershey Bliss chocolates wrapped in purple foil on top. Secure the bag with raffia ribbon. Poke a whole in the green leafs with the wire and tie the wire around the secured bag. Insert two leaves, one on each side of the wire and curl the wire over a paint brush or pencil end to achieve a viney look. Several of these were made as Leadership End-Of-Year gifts. It is an inexpensive way to give many an artistic gift that carries much more value than its Dollar Store origin. Everyone who received them seem to be delighted with them. Jesus said, "I am the Vine, you are the branches." John 15:5 was our scripture verse for the year. It was written on the bottom of the cup and sealed so all of the women could have a sweet memory of our 30-week study of John. Spring is in the air, birds are chirping louder, I hear neighbors enjoying their swimming pools, I can smell the tender smoking meat on barbecues, and am enjoying the warmer weather. Southern California is so beautiful year round, but especially in the Spring. Flowers of all types are exploding with life, vigor, and colors of every hue. I can think of nothing I would enjoy more than having a few treasured friends over for a nice meal. Garden of Friendship was a perfect name for this even as this party was held for a dear friend's birthday with a full bouquet of friends. It was a surprise too! 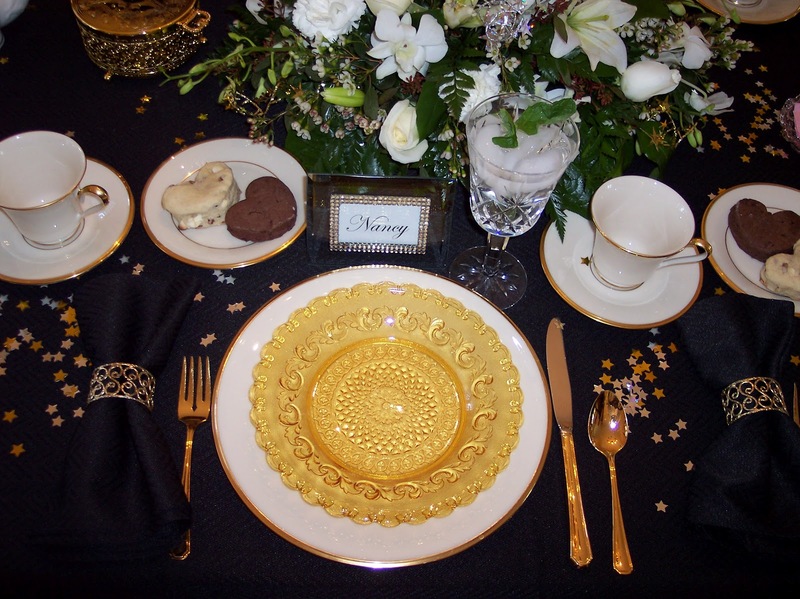 Napkins were folded and twisted to form lily pads and placed within the drinking glasses. Name tags were printed on leafs and mounted on ladybug name tag holders. A delicious shrimp cocktail with avocado, Jalapeno peppers, mango, lemon juice, tomatoes and olives launched the feasting. The link to this shrimp cocktail, I believe, will be better than what I served. Chilled cantaloupe soup with orange juice and basil provided a refreshing surprise. Make this about an hour before your meal. If you let it set overnight, the orange juice and basil cannot be detected! Do you notice the complementary frog fabric beneath the outrageously delicious Asparagus in Phyllo dough laced with Parmesan cheese and fresh pepper. The dipping sauce was to die for! I will definitely be making these again! A table still in progress. Although they were intended as party favors, my guests graciously insisted I keep the felt watering pails, frog favor holders, and potted plants so that someone else could be blessed with the beauty of the event. I hoped they would be wowed and I wanted them all to feel special, and they were, but the friends I have are the kind that want others to share in a good time too. Thanks dear friends! You know who you are! I used Fiesta Ware dishes in orange, red, yellow and green. The orange and white polka-dotted fabric square set atop the bright yellow tablecloth highlights the orange flowers on the watering cans. The red flatware highlights the flowers on the plate and the lady bug name tag holders and lady bugs on the watering cans. I filled the glasses with flavored water with added fruit slices to bring in color. Scanning a preponderance of magazines, the ideas in my mind, cookbooks, and Pinterest saves, I came up with many delightful surprises for my guests. As I viewed my set table, I wondered "What can I fill those cheerful frogs and felt watering pails with that will activate the oohs, ahhs, and wows" and make my guests feel extra special? I wanted to find or create something that I couldn't wait for my friends to discover as they took their seats to share in sweet friendship, delicious offerings, and little surprises. Cute business sized cards were produced with inspirational thoughts to brighten their days, printed in green print, enclosed within a business card sized envelope, tied with striped string and embellished with a sequined-flower, and set within the felt frog holders. I roasted walnuts and glazed them with brown sugar, orange juice and cinnamon. They were placed within a cellophane bag and tied with an orange and white gingham bow, allowing the ribbon to be longer to stretch out of the watering can for a pleasant visual effect. Ooooooh, they were sooooo good! Because everyone wanted to bring a dish, this dinner was the success it was. Marinated filet Mignon, spinach and olive orzo, and corn on the cob were served for the main dinner. All made by master chefs! (At least they were in my mind,) A home-made peach cobbler (with peaches from my guests grandmother's peach tree) along with vanilla ice cream brought the dining to a very satisfying conclusion. My friends are DELIGHTFUL!! Hope you can duplicate this meal in the future. You will not be disappointed. These are, by far, the BEST scones I have ever eaten. And I have had many types of scones. Each February, I host a Tea for about 28 women and we ALWAYS have to have the Chocolate, Chocolate Chip Scones on the menu. I have shared this recipe with many. Janice makes them each year for our Tea. She says she freezes them before bringing them and I think there is something magical about that! We warm them in the microwave just before serving. It's almost, well it is, starting the Tea with dessert first! Because of these, by the time my guests get to their real dessert, much of it is taken home in creative to-go containers. See: Unique To-Go Container I like that, because my guests are able to enjoy another Tea at home, perhaps sharing it with a loved one. These scones are delightful with raspberry jam and my recipe for Old Fashioned Clotted Cream. The other scones shown here are White Chocolate, Apricot & Pecan Scones. They are also out-of-this-world delicious. All three recipes are posted here for your enjoyment. Preheat oven to 350 degrees. Lightly butter a cookie sheet. In large bowl, stir together the flour, sugar, brown sugar, baking powder, and salt. Cut the butter into 1/2" cubes and distribute them over the flour mixture. With a pastry blender, cut the butter until the mixture resembles coarse crumbs. In a small bowl, stir together the milk, chocolate, egg, and vanilla. Add the milk mixture to the flour mixture and knead together to combine. Knead in the chocolate chips. Roll the dough into a ball and then with a rolling pin flatten to about 1/2" thick. Cut the dough into desired shape with cookie cutter. Place on un-greased cookie sheet, and bake for 17-20 minutes, or until a toothpick inserted in the center of a scone comes out with only a few crumbs clinging to it. Remove from baking sheet, serve warm, or cool completely and store in an airtight container. Makes 8 scones. Preheat oven to 425 degrees. Lightly butter a baking sheet. In a large bowl, stir together the flour, sugar, baking powder, and salt. Cut the butter into 1/2" cubes and distribute them over the flour mixture. With a pastry blender, cut into the butter until the mixture resembles coarse crumbs. In a small bowl, stir together the cream, egg and vanilla. Add the cream mixture to the flour mixture and stir until combined. Add apricots and nuts. With lightly floured hands, pat the dough into a 1/2" thickness on a lightly floured cutting board. Using a floured cookie cutter cut into desired shapes. Bake for 13-15 minutes, or until lightly browned. Remove the baking sheet and cool for 5 minutes. With a spatula, transfer the scones to a wire rack to cool. Serve warm or cool completely and store in an airtight container. Makes approximately 14 scones. This mock clotted cream possesses an old-fashioned, but delightful flavor. Guests always ask for the recipe. Whip the cream until stiff. Add the sour cream and mix together. Add brown sugar to taste and spoon into divided dishes, or footed-candy dishes. In the other side of divided dish, place raspberry jam. Chill until ready to serve. Mary Carlson's recipe for Chilled Raspberry Soup is beyond wonderful. With a hint of spice it makes your mouth dance with flavors and refreshment. This is perfect for a Tea or luncheon and everyone always wants the recipe. You can add a mint leaf, flower or raspberry to the sour cream dollop for a sweet embellishment. Hope you enjoy making this very delightful Spring/Summer soup. Mash berries, water and wine together. Place in blender and puree. Place in a large pot. Add cranberry juice, sugar, cinnamon and cloves. Bring just to a boil over med heat. Strain and cool. Whisk in lemon juice and yogurt. Chill. Serve with a dollop of sour cream and a raspberry and mint leaves, or an edible flower of your choice. 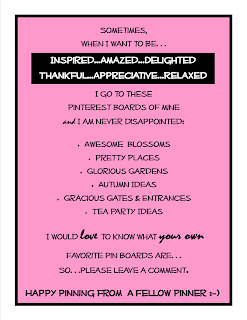 Do you know about Pinterest? It's a place to create your own virtual scrapbook of "pinned" images that you can share and re-visit over and over again. I don't know about you but I find delight in viewing and adding to my virtual Pinterest Boards. I am just in awe when I see God's creation and other people's creativity. I just want to say how much I appreciate the people who take the time to add beauty and delight to other people's lives as well as their own. People so generously share what they've learned and recipes they love. People share pictures of extraordinary places they've been. I especially appreciate the many skilled cooks that link recipes to their blogs where you can glean even more ideas to enhance your domestic life. You are able to find virtually anything you are interested in and meet people from all over the world. I am a Pinterest fan. I hope, if you haven't already, that you will enjoy the experience of "pinning' and it will bring delight to many of your days. Try this very clever tasty floral treat. I think it would work well in tropical drinks and smoothies too. So easy, you need only follow the pictures. This author/creator's website is in another language!